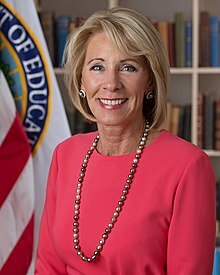 The United States Secretary of Education is the head of the Department of Education. The Secretary is a member of the President's Cabinet, and 16th in line of United States presidential line of succession. The United States Secretary of Education deals with Education. In 1979, President Jimmy Carter established the Department of Education as a cabinet-level agency. Previously, Education had been handled by the Secretary of Health, Education, and Welfare, henceforth known as the Secretary of Health and Human Services. The current acting Secretary of Education is Betsy DeVos. This page was last changed on 2 April 2019, at 15:32.